Through her illustrated journalism, painting, and collaborations with cultural/political influencers such as Jay Z, Matt Taibbi, and Spike Jonze, Molly Crabapple tackles the injustices of our time with an arsenal of weapons comprised of pens, brushes, and words. 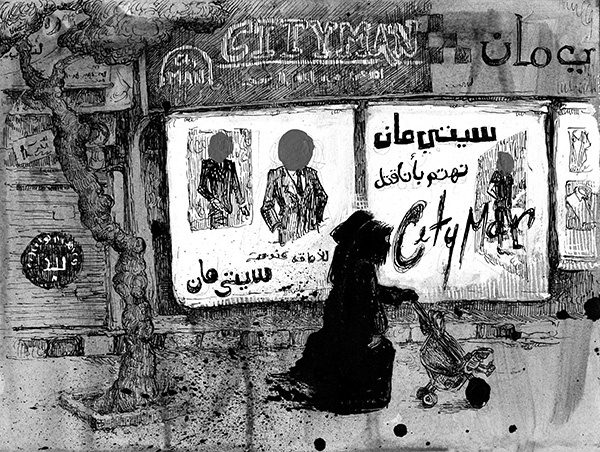 Her work has taken her to Syria, Lebanon, Turkey, The United Arab Emirates, Spain, Greece, Guantanamo Bay, and recently Port Isabel in South Texas where she encountered numerous challenges from ICE officials all detailed in a series of tweets posted on July 17 (@mollycrabapple) that are a must-read for all. Her published books include Discordia (with Laurie Penny) on the Greek economic crisis, and the art books Devil in the Details and Week in Hell. Her illustrated memoir, Drawing Blood, received rave reviews in The New York Times, The Economist, Die Welt, and other prominent newspapers and cultural outlets. Last May, Random House’s One World imprint released Brothers of the Gun: A Memoir of the Syrian War; Marwan Hisham’s account of life under ISIS in Syria, co-written and illustrated by Crabapple.